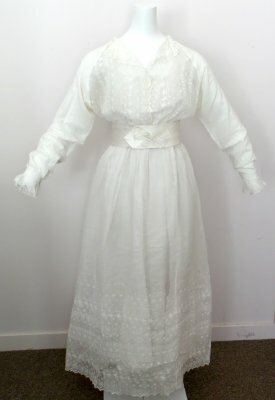 Description White wedding dress worn by Ethel Maude Andrell when she married Harold William Gordon (John) Wratt in 1916. Garments were all made by the bride. Eyelet embroidered organdie gown with two petticoats. Also in the collection is one pair of canvas shoes and white cotton stockings.